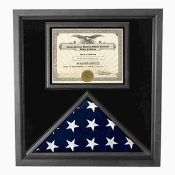 The service of the veterans of our country should never be overlooked. 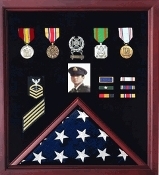 No matter what branch of service, whether it was only one tour or a lifetime career’s worth of dedication, our service men and women should be honored and celebrated for their service. 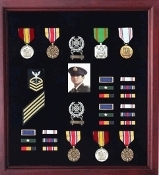 Something that happens more often than you might think is veterans going through their careers, not matter how long or short, accumulating medals and awards and relegating them to a shoe box or a drawer somewhere in the house. This shouldn’t be allowed to happen. 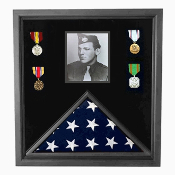 The awards and medals that veterans receive should be shown, displayed beautifully for all to see. They have made their country proud and their families even prouder. These recognitions should never go unnoticed. 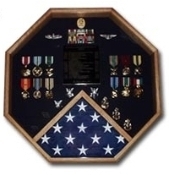 If you have a loved one who has served in the military, regardless of the branch, and has accumulated medals and awards with no place to show them, consider this Flag And Medal Display Case. 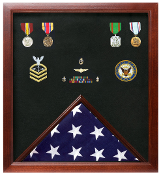 This Flag And Medal Display Case is a very high quality case is designed for a 5’x9 ½’ flag to be displayed in its folded form. It is available in Heirloom Walnut or Cherry finish with beautiful beveled glass and a solid wood back panel. 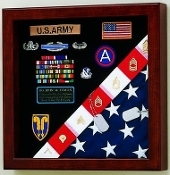 Below the flag display is the perfect place to display any medals, patches or other hardware that you would like displayed. 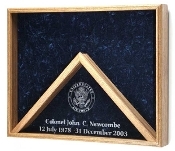 The glass panel opens and shuts for easy removal of any items and stays securely closed with a hidden magnetic closure. 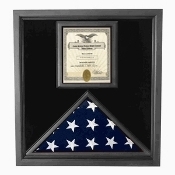 This case is made entirely in America with the finest construction. 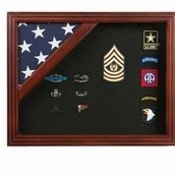 How much sense would it make to display your hero’s American medals in a case made anywhere else? 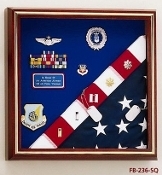 The pride you have in your veteran is taken from the same pride that is felt in making this case. 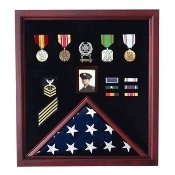 It is crafted by hand by people who take a great deal of pride in wanting to give something back to those who have given so much, whether they be active or retired military or even the police and firefighters who serve us in our communities every day. 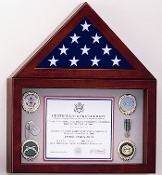 This Flag And Medal Display Case can also be embossed with or without the Great Seal Of The United States. Either way, the elegance of the display will be the envy of all who see it. 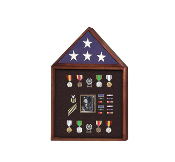 Family functions, neighbor visits, Veteran’s Day reunions will all be so much more special when this Flag And Medal Display Case is filled to the brim with the history and stories of what your veteran has done for our great country. This case will be everything you hope it to be: elegant, beautiful, well crafted and unique. 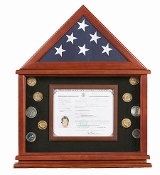 If you desire, you can select a service specific brass medallion or an etched specialty colored medallion for an additional fee. This is the case you’ve been looking for. 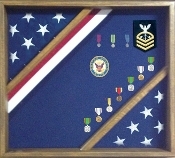 Take the medals out of that shoebox and display them proudly.